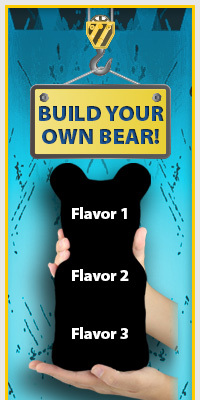 When a 5 pound bear is just too much for your tummy, try this Big Bear!™ made of gummy! It’s the perfect snack size and makes a great party favor. Our ORIGINAL Big Bear!™ comes in packs of six which weigh approximately ¾ pound. Each made in the USA bear is 2¾” x 1½”. Customize the flavors in your six pack today!